October 21st 2015 has come and gone, and while the future isn’t exactly like how Back to the Future Part 2 predicted, Nike and the Michael J. 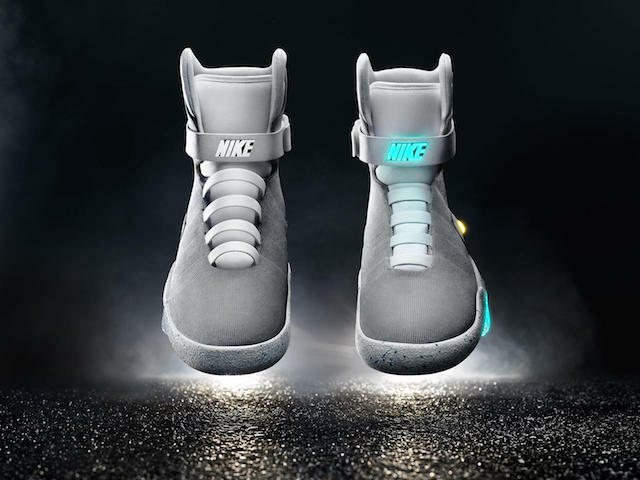 Fox Foundation for Parkinson’s Research have teamed up to make one of the movie’s predictions a reality, with the self lacing Nike Mag sneakers becoming available in a series of charity auctions, with all proceeds going to the charity, in the Spring of 2016. Previously, a charity auction for 1,500 pairs of non-self lacing pair of Mags raised $5.6 million in 2011, so I wouldn’t be surprised if this auction would raise even more. While it’s unknown if the availability will be increased (everybody will want a pair no doubt), there is no denying that this is for a very worthy cause. Fittingly, the first pair went to Michael J. Fox, and you can watch the actor trying them on for the first time below, as well as a hand written letter sent to Fox from Nike designer Tinker Hatfield.